Welcome to fishing in the rural northeast corner of Vermont. This is big lake and big lake trout country. Landlocked Salmon may also be found in some of the deep glacial lakes in the area like; Memphremagog, Caspian, and Lake Willoughby. In addition to trout fishing, bass, salmon, pickerel, pike, sunfish, eels, and other species may be found. Please share your Vermont fishing questions, updates and comments. To feature your business in VTLiving, contact us. Island Pond – Brighton, VT – Rainbow Trout, Brown Trout, Smelt, Perch, Pickerel, Smallmouth Bass, Largemouth Bass, Catfish, Panfish, Burbot. Barton River – Barton, VT – Brook Trout, Rainbow Trout, Brown Trout, Perch. Black River – Brook Trout, Rainbow Trout, Brown Trout, Perch, Catfish, Walley. Clyde River – Newport, VT – Brook Trout, Rainbow Trout, Brown Trout, Perch, Landlocked Salmon. Connecticut River – Brook Trout, Rainbow Trout, Brown Trout, Perch, Pike, Bass, Burbot. Lamoille River – Hardwick, VT – Brook Trout, Rainbow Trout, Brown Trout, Perch. Fish Vermont! 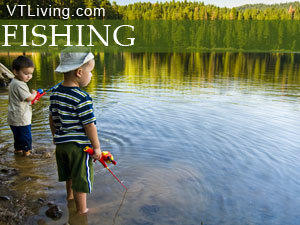 Explore Vermont fishing vacations, photos, guides and information. Champlain Valley, Northeast Kingdom, North-Central, South-Central and Southern Vermont Fishing.